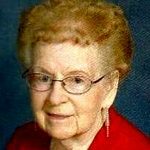 Joy E. Skeel, 94, of Jamestown, ND, died peacefully Monday night, May 14, 2018 at Ave Maria Village, Jamestown. 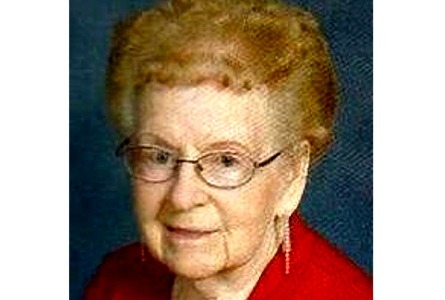 Joy was born January 9, 1924, in Shumway, Ill, the daughter of Rev. Samuel and Janet “Jennie” (Russell) Umphrey. She received her education in Jamestown, graduating in 1942. Joy went to Seattle, WA where she married Woodrow C. Skeel on July 21, 1942. They moved back to Jamestown in February of 1946 and Joy worked for Skeel’s Paint Store, Tempo Department Store, Lifestyle Appliance, and Edgeley Apartments as a bookkeeper. After retiring, she enjoyed volunteer work at Jamestown Hospital doing telecare, and Central Dakota Nursing Home playing cards. Joy was a member of Trinity Lutheran Church, the Faith Circle, did home visitations and served communion to shut-ins and helped assemble the Bond. She was also a member of the Ave Maria Village Parish Care Team. In 1990, she was thrilled to be chosen as Volunteer of the Year at Ave Maria Village. Woody died on October 5, 1985. In 1982, she married Art Bieber. He died on May 3, 2006. Joy enjoyed baking, cooking, and playing cards. Joy is survived by her daughter, Charlaine, Minneapolis, MN; Charlie (Jan) Skeel, Jamestown; granddaughter, Krista Benninger, Minneapolis; grandson, Brandley, Minneapolis; adopted grandson, Justin Brodie; and many loving nieces, nephews, and friends. She was preceded in death by her parents; two husbands; three brothers, Gail, Joe, and Paul; and five sisters, Florence, Vivian, Sarah, Viola, and Faye. The Skeel family is most appreciative for the care and comfort that the Ave Maria staff provided for Joy during her stay there. Funeral Service: 10:30 a.m. Friday, May 18, 2018 at Good Shepherd Chapel, Ave Maria Village, Jamestown, with Pastor Kristi Weber officiating. Visitation: 1:00 p.m. to 7:00 p.m., Thursday, May 17, 2018 at Williams Funeral Home, Jamestown.